My name’s Peter Chua and I’m Singaporean born and bred. I was actually a musician and singer, like my Dad until I had to join the army at the age of 20 which is compulsory here. When I completed my two years service, I called all the bands I used to sing with, but of course they had replaced me… well it had been two years. I began to study programming, but needed to make some money, so a friend offered me a job as a barback. I soon realised bartending had a lot in common with being on stage in regards to entertaining people, working hard and being creative. After working at various bars in Singapore I was asked if I’d like to be a bartender at a house party, but what I didn’t realise was it was actually an interview for a new bar they were planning to open in Singapore which everyone now knows as 28 Hong Kong Street. As I’m Asian and my parents would kill me if I didn’t have some kind of degree, they understood my passion for bartending and allowed me to pursue my dream as long as I acquired a degree in hospitality. So I studied during the day at the University of Nevada, Las Vegas (which has a campus in Singapore) and worked at 28 Hong Kong Street in the evenings, which I won’t lie, nearly killed me. The next few years were spent learning, reading and honing my craft. 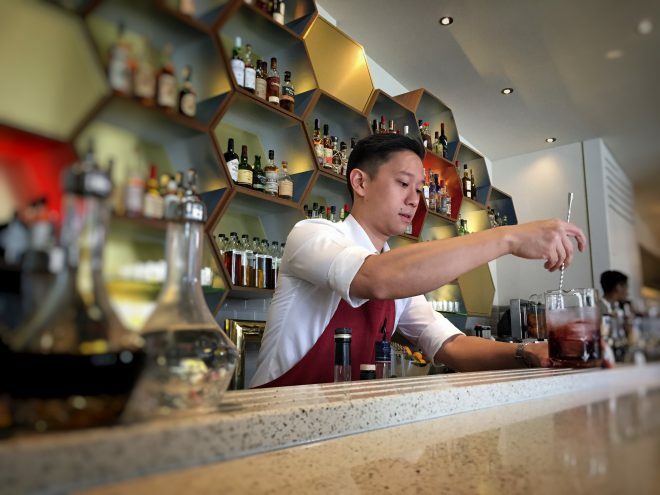 I’ve been really lucky doing the right thing, in the right place at the right time and now that Singapore is considered an important destination for cocktails… it makes me proud to be a part of that. Right now Crackerjack is my dream bar. We have created an all day venue that concentrates on fabulous service and hospitality and only use the freshest quality products. We serve coffee, food and cocktails. The only thing I would change if it was possible and as you said anything was, is the tax. In this country the taxes are crazy and make everything very expensive. If I could, I’d lower the tax on alcohol and other products we use so I could lower the prices for my guests. I just want to make enjoying cocktails and going out more accessible for everyone. Luckily my girlfriend is very understanding because I do like to spend a lot of time alone after such long hours in the bar. I generally spend that time gaming, reading and writing music. Wow that’s a tough question. Right now I’d say it’s agave spirits. Both mezcal and tequila because I’m really delving into Mexican distilling at the moment. A balanced drink that fits the customer. I like to think of a drink as a painting the client has commissioned and you cannot disregard their taste and preferences when you are choosing the canvas, what medium you use and the way you frame it. Fat washing with butter as it gives a great mouth feel and has an umami quality. I like to use unsalted french butter. I’m going to put a Singapore stamp on this question. My partner Zac from Crackerjack, Luke from Operation Dagger, Joe from Tippling Club, 28 Hong Kong Street, Manhattan and Skinny’s needs to be your last stop.